Here’s a nice little example of how my growing up engulfed in the world of sugar induced entertainment has melded with my current search for artistic integrity in Los Angeles. I recently got a kitty, the black one in the picture below. Not the greatest picture, but the best perhaps that a cell phone can manage. 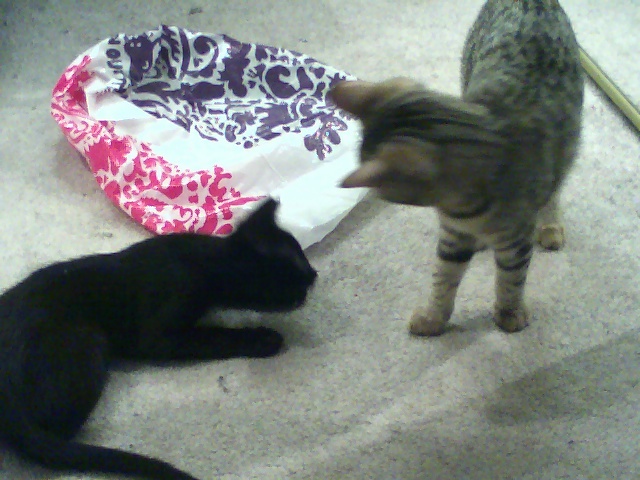 Muppet is the brown kitty (my roommate’s) and Mario is the black one (mine). I named him Mario because the gal I got him from has done the voice for the Princess in the Mario Brothers games since 2000. The first video game I played on my self bought Nintendo system when I was 8 years old was Mario, and since then I have finished every game published with the Italian plumber. This entry was posted on June 27, 2006 at 7:28 pm and is filed under Uncategorized. You can follow any responses to this entry through the RSS 2.0 feed. You can leave a response, or trackback from your own site.